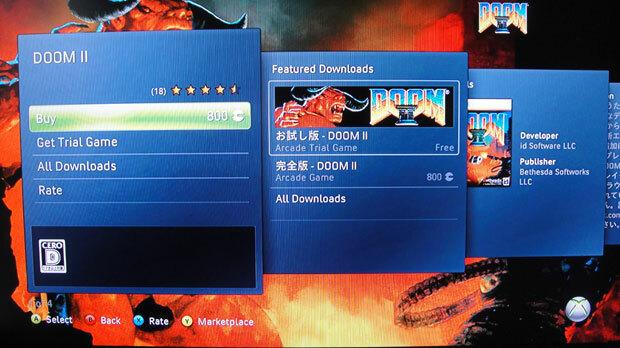 Last I asked, Bethesda would only confirm with me that id Software's Doom II port was still headed to Xbox LIVE Arcade. Well, it's available now… but only in Japan. Yup, the game has made a sudden appearance on the Japanese Xbox LIVE Marketplace; it'll cost you 800 MS Points. The demo can also be downloaded, in case you don't know Doom II is like. But if you already do, rest-assured that this port is just that… Doom II. No word on when it'll hit North American consoles, a good guess might be "soon." Can't wait? Nothing's stopping you from creating a Japanese Xbox LIVE account so you can download it now.